None of the usual aurora forecast sites were going for any significant aurora activity during this period at all however during the morning Spaceweather.com updated their front page regarding a 'heliospheric current sheet' event which could trigger a G1 geomagnetic storm. At a first glance this seemed quite sudden and contradictory in comparison to other sites however when I checked the charts during the late morning of the 7th I suspected that Spaceweather where onto something and my instincts told me there was going to be a nice show after dark. The IMF was strongly negative all day varying from -9 to -12 and staying negative for hours and although the solar wind speed was only between 300 and 400 km/sec I knew from experience that the highly favourable negative Bz tilt was going to be the prime reason why a decent aurora would be possible after sunset. The forecast was good with clear spells inland before a front arrived from the W later in the night which would introduce cloud so I couldn't justify any long road trips so if the aurora did kick off then I would be staying local. The sky was also dark and moonless so conditions were lining up nicely for something special. Conor McDonald and I were discussing the situation via pm on facebook and both of us agreed that the charts looked good and that an aurora watch was warranted. The clock was ticking, the sun had set at 20.00 UT so Conor and I agreed to meet up at 21.30 UT and find somewhere local to watch any aurora which might show itself. In the meantime we kept refreshing the charts, I filled a flask of tea while Conor filled a flask too, it was cold outside with a bone chilling breeze so we both wrapped up well, dusk had arrived and within a few min's I would be hitting the road, however the big question was where could we go that's dark and which would offer some decent foreground for photography? Rewind the clock back 48 hours earlier. After a day of cloud and rain the late evening cleared up beautifully and soon the sun was shining and the wind fell calm, it was the kind of evening that called you out, the fresh clean air with scent of Spring in the air that made me want to make use of such good light. There was just over one hour until sunset, this was golden hour when the sun was low enough to cast long shadows, offer good contrast and relief and provide warm light for photography. I decided I was going to take the Phantom 3 Advanced quadcopter out for a flight however I needed something to film, I simply decided to go for a drive and see what I could find, my Mum also joined me so together we drove out under the late evening sunshine and into the invigorating country air. I drove outside Maghera and when not far from Tirkane we stumbled across a hidden lake which I had visited several times in the past and which I had completely forgotten had existed, I felt like I was meant to find it in some bizarre way, almost as if it had been calling me all evening, so I trusted my instincts and pulled the van in for a look. 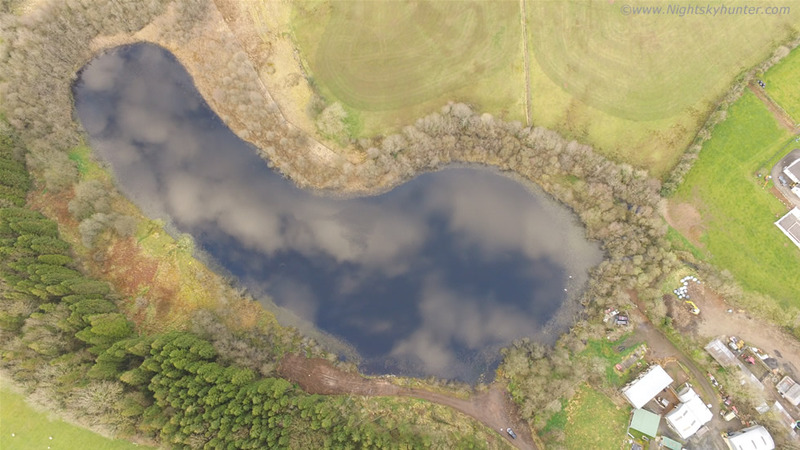 I liked the atmosphere immediately and soon the drone was airborne and I ended up having a wonderful fun flight low around the pond and far above while Ducks and Swans complimented the silent lake. I would later learn from my cousin that this was called Killyleagh Lough, the highlight of the flight for me was the calm surface of the lake which in places seemed like a mirror and as I panned the camera straight down perhaps 10m above the water I could see the blue sky and puffy white altocumulus clouds reflecting upon the water, it seemed that the ground and sky had become one. When I landed I checked the sat nav in the van and noticed with great interest that my view across the lough was facing due N, I thought to myself this would be a good local spot for auroras and NLCs, however I thought that opportunity may not present itself for some time to come. Two nights later I thought ''Killyleagh Lough! '', this is where we would watch the aurora from as a test to see if it had potential, and besides it was somewhere completely new which added to the adventure. When I left the house I noticed in an instant that there was something wrong with the twilight sky, the glow was too bright, too large, and seemed to sport a subtle purple colour so I suspected that the aurora was already there, and shockingly it looked bright and quite significant, this was already better than what I had expected. I met Conor then we drove to the lake and just as we arrived on location- and before proper dark adaption - we could see the aurora through the windscreen!. We got outside and I got the camera set up on the edge of the lake and began doing a time lapse at ISO1600 10mm F/2.8 then Conor and I stood back, adjusted to the darkness and watched with great anticipation. The clouds cleared and we got treated to an excellent clear sky with keen transparency. The land around the lake was very dark, we were surrounded by tall trees to the E and W which accentuated the darkness by shutting out any residual light pollution, Conor and I both said that this was going to go into outburst at any moment, then at 22.00 UT the aurora went into a sudden and dramatic outburst. The band intensified with green colours to the naked eye then green rays/beams appeared, at first to the NW then N and NE, we could also noted a subtle red hue above the band washing the stars from the sky like an auroral mist. The band rose in height and began exhibiting real time motion in the form of changing forms, accessory patches, pulsations and even two tier structure at one point. The aurora was so bright it reflected upon the water and the section to the NW was so bright above the pine trees that we at first thought it had to be the security light from a house until we realised it was the aurora itself! The rays extended over 35 degrees high (70 full moon diameters) with five or more visible at the same time slowly meandering from R to L across the band with a few sudden taller beams shooting upward through Cepheus pointing directly to Polaris. Although we could see green and red colours the fast lens on the camera also picked up vibrant pink and purple which was absolutely beautiful. Conor and I got our flasks from the van, I had a brew of black tea while Conor had peppermint green tea then we stood together watching the aurora discussing its finer points as we enjoyed our hot brews, life didn't get any better than this, the aurora was impressive and much more than we had expected to see, it almost seemed like it was meant for us. The band grew incredibly bright at this point, it looked like a green rainbow to the naked eye illuminating the lough, I have to laugh when people say that you cannot see the colours of the aurora without a camera, those people should have been standing here now, the green was in our faces and to the NW the aurora was so bright it blocked out all the stars below mag +4.0 in that area above the trees - the stars were simply not there anymore. We had a second brew to combat the cold breeze then the aurora faded back to a glow then a few min's later it went into a second outburst before finally settling down until we could see no aurora at all and it was gone just like that. We packed up and used the down time to change location and ended up driving over the pitch black mountains above Swatragh however mist and cloud had covered the entire sky, we actually thought it was game over until we drove to lower ground and a little E of Maghera into deep countryside when we suddenly saw the stars out again. We found a quiet location, reversed the van into a field (the gates were open) then Conor and I stood on a narrow country road in what seemed the middle of nowhere and continued observing. Just as we get set up we saw a peculiar auroral beam in the far W, there wasn't a hint of aurora anywhere in the sky except for this bright and solitary ray shooting up from behind a bank of clouds at a highly slanted angle, it seemed to sit in the one spot with red/pink colours and located close to Orion which was setting towards the horizon. I suspected this could have been a proton arc, most aurora forms are caused by the collision of electrons with Earth's magnetic field however a heavy bombardment of protons can cause these bizzare isolated intense single ray manifestations. I can assure you that upon arrival this looked very bright and different from typical rays in a manner which is difficult to describe and by the time I got out the 50mm F/1.8 lens and focused the ray had faded a great deal, however I at least got a record of it. We spent the next several hours standing on this road drinking another brew, sky watching, and having a great conversation. This reminded me very much of the good old days, Conor was not long back from Australia however previous to this we grew up together watching the sky just like we were doing now and putting in an incredible amount of hours observing and photographing weather by day and meteors, comets and auroras by night, it felt that despite all the years away and the changes in life some things remain the same - good things like this when time seems to stand still under a beautiful dark starry night. The aurora went into a third outburst after 01.00 UT then we both observed a head-one meteor each, first Conor from the NE then myself from the SW, that was something I had never experienced before in my life. Seeing one head-on meteor during the course of a night is rare enough but observing two in close succession from different radiants was a completely new experience for me, perhaps it was nature's way of acknowledging our dedication after all these years. We called it a night at 02.30 UT and drove back home feeling happy and content, this was my 148th aurora display and it was a sweet one - like all the unexpected auroras. 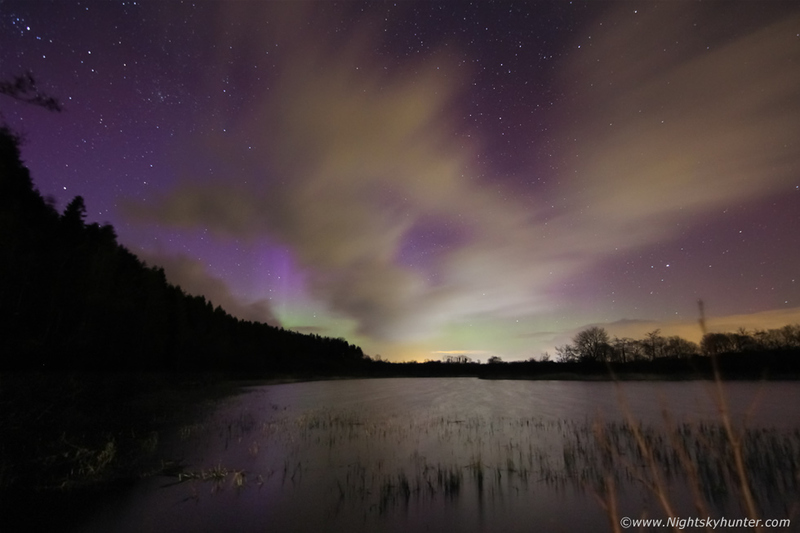 Time lapse video of the Killyleagh aurora outburst using the DSLR and 10mm lens. The finished lapse didn't work out well because I didn't take enough frames and there was too much motion going on between exposures which makes the final time lapse look very swift, however it might give you some idea of what it was like. I am more than happy with stills from this brand new location which already has a high sentimental value to us. Phantom 3 Advanced drone footage of Killyleagh Lough before sunset on a calm day with the surface of the lake like a mirror with the reflection of beautiful altocumulus clouds on the surface to give readers who dont know the area some idea of what this lough is like during daylight hours. Thanks very much for reading.